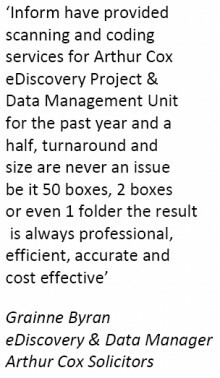 Informa’s service-offering is unique in Ireland; we are the only ISO27001 accredited Scanning Bureau whom offer both legal scanning & coding (indexing) services along with eDiscovery reviewing technology. Our ISO27001 standard gives our clients an added assurance when outsourcing information and data to a third party data-processer. Informa have provided scanning & indexing services since 1993 and we are the preferred scanning providers to many of the leading Solicitors’ practices in Ireland. Understanding the time constraints within which the legal sector engage, our flexible operating hours mean that an urgent folder or box can be collected and returned next day if necessary.